This is a privately owned unit and guests are renting directly from the homeowners whose company name is Mau Loa HBR Vacations (as will appear on your credit card statement). Therefore your reservation is non-transferable between other properties. Resort Fees: HANALEI BAY RESORT WILL CHARGE YOU $20 PER DAY FOR RESORT USAGE. THIS INCLUDES POOL TOWELS,AMENITIES AND WIFI. THERE ALSO IS A $6 DOLLARS PER DAY PARKING FEE PER CAR. THE GUEST IS RESPONSIBLE FOR PAYING THESE CHARGES WHICH ARE DUE AT CHECKOUT. Resorts that require “resort fees” for guests staying on the property solely make the decision on what the amount of the fees will be and it is out of the control of the owner of this property. These fees are subject to change at anytime without notice and could change before your arrival and could be different than the original fee stated in your reservation. We make every effort to communicate changes in fees as soon as we are notified. Amenities provided by third-party vendors (for example utility companies or subcontractors) are beyond our control. We do our best to provide services such as cable television, internet , and resort telephones. Should these be unavailable for part or all of your stay we will do our best to help restore services, but ultimately cannot be held responsible. Should you absolutely require internet access we recommend you make arrangement for these services through a cell phone company. The regular occupancy for 4323 is 4. 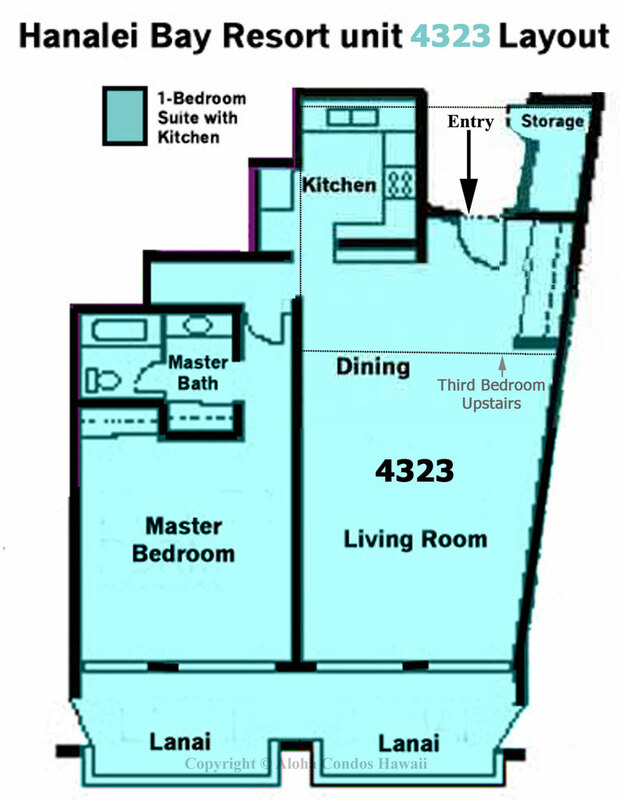 The regular occupancy for unit 4324 is 2. The regular occupancy for 4323/24 is 6. Guests are obligated to disclose the actual number of occupants prior to arrival. Check-in time is 3 PM and checkout time is 10 AM. Please be certain to plan your arrival and departure times accordingly. Please understand we have a fluid cleaning schedule to accommodate so all condos are in terrific shape when guests arrive and we need to accommodate last minute bookings. If we have a back-to-back (one set of guests leaving in the morning and another arriving in the afternoon) the cleaning takes several hours for most units. For this reason housekeepers need to begin the cleaning at 10:00am. Extra charges will apply if you have not departed at 10:00AM If you need an early check in or late check out we recommend you book an extra night. We provide sheets for each bed and two bath towels per stated guest. There is no daily housekeeping service, but you are renting 4323 or 4323/24 you are welcome to use the washer/dryer in the unit. If you are renting 4324 you are welcome to use the coin operated washers by the 4000 buildings. If you have an interim clean included with your reservation we will launder the linens during the clean. Please do not leave personal laundry in the washer when housekeeping is coming for the interim clean. Hanalei Bay Resort is always a destination we highly recommend. This unit specifically was great for 6 people, all the amenities were perfect, and we're truly hoping to visit on a regular basis. The staff and grounds at Hanalei are hard to beat, and are exactly what is needed on a relaxing vacation. Thank you for sharing your rental. This was the perfect vacation Condo for our family. The layout was comfortable & well appointed. We enjoyed relaxing breakfasts on the balcony with a view of the beach and fell asleep every night to the sound of crashing waves. We were grateful to have the Beach chairs, snorkel gear, ice chests all available for our adventuring. The grounds are lovely, & the condo is close to both pools with an easy walk to the beach. We would be happy to stay here again! Great condo, beautiful views, comfortable and beautifully decorated. Would stay there again. We had a great stay in the condo. It is beautiful. There was plenty of space and the kitchen was perfect for preparing meals. The views were amazing and we spent evenings watching beautiful sunsets. We would definitely return next time we are in the area. Our condo unit had a spectacular view of the bay and adjoining cliffs. We were very comfortable throughout our stay, and the general location is quite good relative to Princeville amenities. The pool bar is nice, although poolside seating during our stay was a little crowded. I wish housekeeping services would have been provided as part of our package. The bellhop service was slow, but that may have been because of the spring break crowd. The Makai Golf Club is first class. Our family of four (two adults, two toddlers) had the time of our lives on an epic vacation at the Hanalei Bay Resort. Staff was friendly, amenities were immaculate, food and drinks were awesome, and everything was just fairy tale perfect. Our condo was lovely and there was beyond enough room for us, we could have brought 4 more people easily. We can't say enough about our stay and would recommend it to everyone! We had a wonderful visit to Hawaii. First we reunited with our son who has been living in Australia for the past year. It was so great to reconnect with him and his girlfriend. Second we recently lost our home in Santa Rosa due to the fire storm. It was such a breath of fresh air to escape to Hawaii and have a break from the devastation. The condo we rented was wonderful. Every morning we had breakfast on the lanai looking out over the ocean. The home was comfortable, had everything we needed to relax. I would defiantly come back. We appreciate you taking the time to post a review for us. We are so very sorry to hear about your home and hope your stay allowed you to escape for just a monent and enjoy. We are glad you found the unit to be comfortable and had everything you needed. It is a great unit and the views are very amazing! We hope all goes well for you in Santa Rosa and we wish you the best. You are in our prayers. My family consisted of 3 adult couples, and we enjoyed having 3 beds without a Murphy bed or pullout couch. This unit is one of very few on north Kauai. The unit had a wonderful view of Hanalei Bay, the kitchen was superbly equipped. The dining table sat four, not six, but we tended to cook and eat separately anyway. Everything was fine except the cost - too expensive. 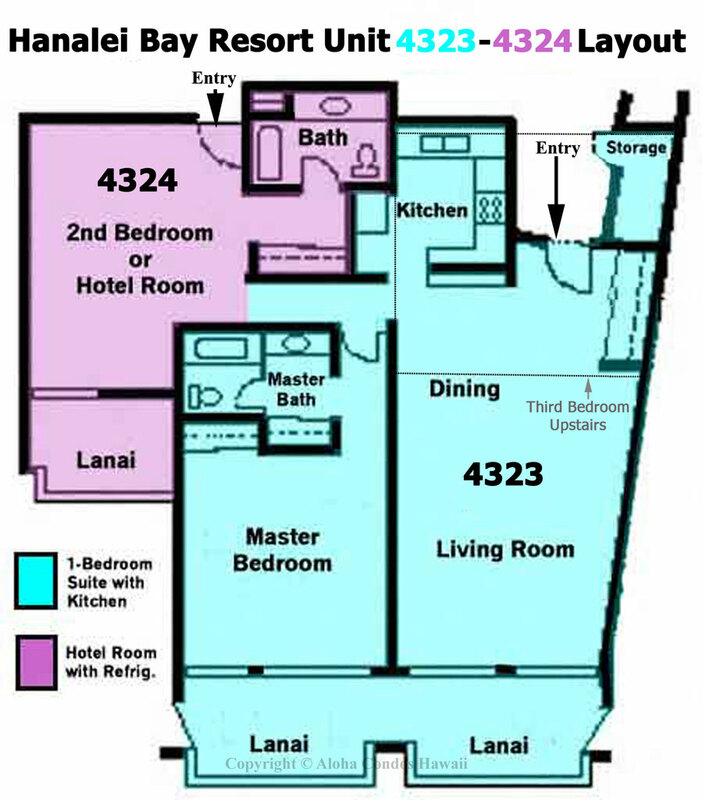 Thank you for your review of the unit 4323/24 at the Hanalei Bay Resort. We are so glad to hear that you found the condo accommodating and well equipped. This unit does have views that are second to none and can be enjoyed every minute! We wanted to note on your comment about the dining arrangement regarding the seating. The dining table can accommodate 6 people comfortably. The extra chairs that match the dining table could be found in the bedroom of 4324 and can be added to the table to accommodate 6. We are glad you enjoyed the condo and hope you can return soon! My sister and I spent a week at this condo in early October. The unit is beautiful and fully equipped. Nothing was lacking. The weather was rainy several days especially n the morning, which made for wonderful lazy times on the incredibly comfortable lanai lounges watching rainbows, nene and chickens. Sunsets were beautiful. The pool was a short walk from the unit and was delightful. Never crowded. I had mobility issues due to a knee injury and the bellmen were so helpful transporting me around the complex when needed. I would definitely stay in this unit again. The owners obviously spend time here and care about the unit. This was a splurge for our family and it was clear when we arrived it was totally worth it. The condo was a comfortable place of retreat and we all had enough room for our own space. The view had me in disbelief the entire week. My husband and I are both writers and spent 1-2 hours every morning on the lanai with the show before us and the soundscape and views and visits from the birds of north Kauai. We are so glad to hear it was all worth it! It is a great condo with amaziing views! The view in the pictures just do not capture it as reality does. The lanai is a perfect spot to relax and realize you are in paradise. We thank you for the review and we hope to see you again! Fantastic view in a very nice, well equipped condo!! We arrived at this condo and were very pleasantly surprised. We rented both 4323 and 4324 (adjoining). There was plenty of space for 5 people (3 adults/2 kids) to spread out. The pictures online are pretty, and we expected to be in an enjoyable place, but it was better than expected. The view off the balconies is GORGEOUS, and the patio furniture was great for spending time outside. The condo clearly has been updated, and provides very comfortable furniture, along with all the necessities you need to make your stay pleasant. The kitchen was very well stocked with all the little extras that make the difference. The closets also had all the accessories you need to have a great day at the beach (chairs, boogie boards, fins, coolers, etc). The only suggestion I'd have would be to add a beach umbrella. Next time we are back in Kauai we will definitely be looking up this condo again! We came to Kauai to get married on the beach with our three daughters and this was the perfect home base! The most impressive part of this condo is the view- you can't beat it! The perfect place to eat breakfast and listen to the birds and look out over the ocean -typically with a rainbow- is on that lanai. I've never stayed in a more magical place. Our kids loved the loft and having the high ceilings made the condo feel huge! The beds were so comfortable like sleeping on clouds! The kitchen was fully stocked with dishes,silverware, pots and pans. There were lots of ice chests, beach chairs, tennis rackets and balls, ect. I couldn't be happier with our condo choice! Our family of three stayed in 4323-24 condo for 5 days in May 2016.It exceeded our expectations - the condo was supplied with everything you could ask for, and was so spacious, clean and welcoming. The view of Hanalei Bay off the lanai is breathtaking... we spent alot of time out there! (we also befriended a local bird who ate from our hands! )To wake up every morning (in very comfortable beds!) looking out over the mountains and the Bay was amazing. A couple of mornings we were greeting by rainbows that you felt you could touch!! In regards to service, I sent an email when we were having a small issue with the television - and Christine responded so promptly, that we weren't quick enough in getting back to her to advise we'd fixed the issue - she had already sent someone to have a look!! So needless to say we were impressed.The Resort itself is fantastic; between the pool, jacuzzi, tennis courts & beach there was enough to do without setting foot outside the resort - and now that the Happy Talk Lounge is open, its a great spot to enjoy food and drinks, and stare at the stunning view from the bar or your table.Princeville Village is close by and has a Foodland with plenty of choices to stock the condo with supplies, and also has a couple of great spots to grab breakfast, lunch or dinner.The only negative is that we did not stay long enough!We are getting ready to book again for next year we loved it so much (not to mention, arranging our wedding onsite at HBR! )Thanks for a wonderful stay. One of the best condos we're ever experienced. Would highly recommend to anyone visiting the North Shore. We have already recommended it to some business associates. 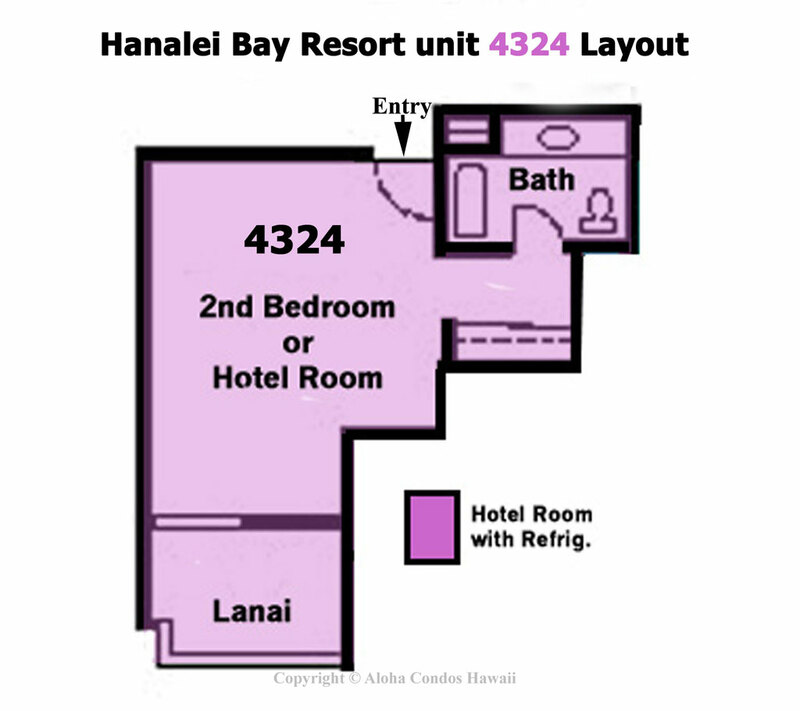 Mahalo for the 5 rating for the unit 4323/24 at the Hanalei Bay Resort. This is a wonderful spacious condo beautifully decorated and recently remodeled. The views from the lanai are second to none and is what makes this property exceptional. Whether it is a morning breakfast or an evening sunset, the lanai experience will make memories to last a lifetime. Thank you for your recommendations and we do hope you will be back soon! Mahalo for your business! We rented HBR condo 4323-24 for 11 days and loved every minute of it. Five adults total and NO problems with feeling overcrowded or not being able to have "alone" time. The condo is updated, clean, well taken care of and the location great, the view is fantastic! Everything works! This condo is on the upper floor so nice cross breeze and air conditioning if you need it. The staff and service at HBR are very nice, helpful and prompt when we had requests. All in all a great condo and a fantastic place to be. Stay on the North shore and Hanalei, you will not regret it. Beautifully appointed condo with stunning views of most of Hanalei Bay from the lanai. Quiet and clean. Well stocked with beach equipment including chairs, snorkeling equipment, and boogie boards (no surfboard but you can rent one from Hanalei Surf Co. in Hanalei). Ultimately, short of renting a house on Hanalei Bay, it is about as perfect as you can get. My only complaint would be with the resort itself. In particular, the temperature of the main pool was so cold that it was unusable. It was rare to see someone swimming in the pool. Also, parking can get difficult sometimes, especially at night and there is often a long walk from the car to the condo. But these are quibbles. Overall, I've rented this condo on two separate vacations and I will consider it again for our next vacation to Kauai. We do appreciate you taking the time to give a great review of your stay at the Hanalei Bay Resort, unit 4323-24. This is a wonderful unit and recently has undergone some remodeling and redecorating. The spacious unit is very accommodating and the open beam ceiling adds to the tropical feel. The views cannot be beat and add to the whole experience. The property is large and consists of 22 acres of beautifully landscaped grounds. We understand that you mentioned the walk from the parking lot was a bit far. It is a pleasant walk though, through the lush landscaping and the hidden treasures that come to life along the way such as the planted orchids growing from the trunks of the palm trees. However there is the option of having the bellmen drive you to your condo to avoid the walk if so desired. The parking lot because the popularity of the resort can be at times something to contend with. The resort is looking into solutions for this. Also with most of the construction completed, it has opened up the back parking lot which will provide more parking options. We want to thank you for your business and are glad to hear of your plans to return again! The apartment was clean, beautiful, comfortable; A nice box of Hawaiian chocolates to welcome us; No problem getting a couple extra hours for late checkout was appreciated; hoping to return; thank you!! This is a beautiful Place, with amazing views! This condo was awesome. It has been completely updated with granite and stainless appliances, comfortable sleeping arrangements, flat screen TV's in both bedrooms and the living room and so much more. The condo was stocked with everything from ice chests, to lounge chairs for the beach - not to mention a FULLY stocked kitchen with spices, pots/pans and knives etc. If you cook, you will appreciate what they offer in the kitchen. The views from both units are of the Hanalei Bay and are spectacular. The resort offers transportation from the parking lot, or really anywhere you want to go that is within the resort area (such as a ride down to the beach, and a ride back if you need). The staff was incredibly friendly and our time spent there was truly paradise. We WILL rent this condo again. Service: every staff person was friendly and helpful. We needed light bulbs replaced and they were-promptly. Questions were answered courteously.The condo: the kitchen was well supplied. The rooms were beautifully decorated. The king sized beds were very comfortable. The whole unit was tastefully updated.The view was magnificent! !Location and amenities: we had the most beautiful view of ocean and mountains. Beach towels were always available. Pool was like that of a 4 star hotel's and the hot tub was a glorious bonus. The bell men were always on time to help with luggage and picking up trash bags.Liked best: the tropical landscaping and our view from the lanai. We were amazed how well kept the gardens were. So pristine! !Liked least: the roosters crowing at all hours of the night! But you've heard this complaint countless times, I'm sure.We usually stay on Maui every January but when we return to Kauai, we will stay at Hanalei Bay Resort!! Thank you, Mahalo, Arigato! Where to begin? This condo is absolutely beautiful! I highly recommend staying here. The views are incredible as is the resort. You will not be disappointed. We stayed for 6 days with my family of three girls and brought our babysitter. The condo is spacious and comfortable. Our sitter stayed in her own unit, which is attached, via a door. She had her own bathroom, lanai, and entry. The condo was recently remodeled and looks fantastic. The beds are comfortable. The master bedroom has a Tempur Pedic mattress and a gorgeous view. My two older daughters loved sleeping in the loft, which they accessed via a cool spiral staircase. Kristin at aloha condos was kind enough to arrange for a pack n' play for our youngest daughter and a high chair to be delivered. The condo is well stocked and we even found sand toys, snorkeling gear, boogie boards, beach chairs, tennis rackets, tennis balls, and many different sized coolers in the closet. This was great for taking on hikes and to the beach. Hanalei Bay Resorts has a beautiful pool and outdoor hot tub. My kids loved it! The pool is on the colder side but this did not stop us from jumping in. The staff at the resort is very helpful and friendly. Check the resort activity calendar when you check in as they have activities for kids and adults at the resort or nearby in Princeville, like lei making, hula classes, yoga, and scuba diving lessons. The beach is a five minute walk-very accessible and the path is right next to this condo. Hanalei is a quick 10 minute drive. There are jogging and walking paths around the different resorts. Princeville town center is right near the resort with a grocery store. You can also walk to dinner or a bar at one of the nearby resort/hotels. I agree that it will be nice when the Hanalei Bay restaurant is finished. We will definitely come back here! It is very apparent that the owners care a lot about making their guests comfortable by thinking of extra amenities that we really appreciated such as umbrellas (for the beach, golf course or rain), quality beach chairs, sand toys, multiple ice chests, boogie boards, tennis rackets and balls, dvd's filmed in Kauai and a good supply of spices in the kitchen. This condo was in an excellent location within the resort. The furnishings and interior were tastefully done and not outdated. We would definitely stay here again. The service at the front desk was great. We loved the condo and spent a great deal of time there, as it rained lots. It had everything we needed. It is decorated beautifully and has the best patio furniture of any other condo we could see from our balcony. Top end stuff for sure! The location was great. When the restaurant is finished, that will be a great asset. The pool and hot tub were perfect. A Kauaii Gem in Hawaii! My husband and I stayed here over the holidays and had an amazing time. It's in the perfect location, right on the beach overlooking some of the best surf waves in Hawaii, and only a short drive to the quant town of Hanalei. The resort amenities are top notch, including a beautiful garden pool, towel service, and tennis courts. The condo was recently rennovated and absolutely stunning, we felt like we were living in paradise as we woke up each morning to the sound of roosters crowing, overlooking the ocean. Having spent time in other Hawaiian islands I have to say Kauaii is really the best place to come for authentic Hawaiian culture and a relaxed pace, and within Kauaii this spot is truly a Gem. Hope to be back! The perfect condo for anyone! When you open the door to this condo you stop in your tracks! First your eyes go to the amazing view of Hanalei Bay and then after you find your breath you gaze around and notice the beautiful condo! Decorated and outfitted perfectly - you feel like you just stepped into a 5 star hotel but with all the comforts of home to go along with it! The oriental artifacts are interesting and beautiful as are the colors throughout . Rich and soothing from top to bottom, not to mention the sumptuous bed linens! Felt like home, slipping into the 500 thread count Egyption cotton sheets. Everything was thought of in outfitting this condo - from backpack style beach chairs to more-than-enough dishes, flatwear and pots and pans (all top quality). We could have just spend our days on the lanai taking in the forever- changing view but the walk down to the beach is short. If you're tired from paddle boarding, snorkelling or kayaking you just pick up the phone at the bottom and shazam! a golfcart limo is there to pick you up at the bottom and deliver you to your doorstep! We will only stay at this condo from now on while visiting the beautiful enchanting Kauai ! This condo was in a beautiful location, with phenomenal views of Hanalei Bay. The interior of the condo was extremely comfortable, with fantastic amenities. This is a well kept, spotless condo that was a perfect vacation spot! We were a short walk to the beach, seconds from a choice of swimming pools and tennis courts - everything was very well kept and clean - a truly stunning location! The unit we stayed in was very well kept and appointed. That made up for the lack of restaurant and/or eating facilities on site. The pool was nice. It seems, however, like the grounds and exterior of buildings are not receiving as much attention as in the past. Overall great place to stay while in Kauai! Having read about the differences between all the vacation condos at Hanalei Bay Resort, I knew I had to pick the exact one I wanted to insure great accommodations for my family. I found this one online. There were many photos and videos, so I knew exactly what I was getting for my money. The unit was exactly what I expected with a spectacular view and new updates. No bad surprises. It was also very clean and the kitchen had everything we needed. We will certainly return to this unit to enjoy the quiet and the amazing view. We never got tired of that view! When we arrived at the property all of our expectations were exceeded! We were greeted warmly by the staff and found the condo to be beautifully furnished and very clean! The welcome basket from Kristen was a nice touch. We will definitely return to the same location in the future and cannot wait! We (family of five, three kids ages 18 - 24) recently returned from a most glorious vacation at Hanalei Bay Resort. The views were astonishing and ever-changing. The resort property reflected the lush and beautiful landscape of Kauai--the swimming pool like a tropical lagoon, the tennis courts artfully placed, the units tucked inside the hillsides, the beach just a short, but hilly, walk away. (For those who have difficulty walking hills, golf cart transportation was available at any time). Resort staff were very friendly and helpful. The unit itself was CLEAN and beautifully decorated and stocked with everything we needed, from dishes, cookware and ipod players to beach towels, laundry soap, boogie boards and zip-lock bags. The beds were extremely comfortable, providing us all with deep and restful sleeps. Every day we lingered over morning breakfasts and evening refreshers on the deck, soaking up the views, the sounds, and aromas of the tropical paradise. The resort's proximity to the charming town of Hanalei, to fantastic beaches, hiking, zip-line adventures, kayaking and dining made it a fabulous haven for those of us seeking adventure and relaxation. Our unit was very quiet--no one was staying immediately adjacent to our unit. But if they had been, I could see that deck conversations might not be totally private or quiet if adjacent units were booked. However, other residents seemed to be very friendly and respectful. Also, the resort restaurant was not up and running---not a problem for us as we either cooked our own meals or ate at nearby restaurants. To conclude, we felt we had won the jackpot and definitely would return to this very same spot. We wish we could go back next week! Hanalei Bay Resort is always a destination we highly recommend. This unit specifically was great for 6 people, all the amenities were perfect, and we're truly hoping to visit on a regular basis.The staff and grounds at Hanalei are hard to beat, and are exactly what is needed on a relaxing vacation.Thank you for sharing your rental.